When did Lipton's add "By Appointment"? . Before 1896, anyhow. This page has an 1896 ad with By Appontment, but also an 1893 ad without it. Here's a large 1892 ad.. I think this would mention the royal appointment if it had happened. John Gibson was there in 1881 (Slater's). "On 28th February 1895, however, his greatest prize to date came to him at long last - the Royal Warrant as purveyor of tea to Her Majesty Queen Victoria." 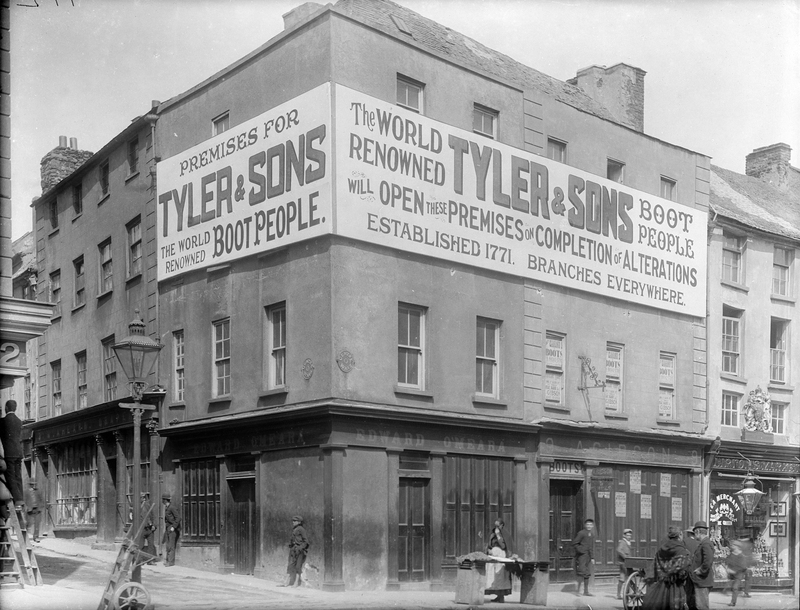 Presumably they would remove the warrant from ads and windows after the death of the Queen in 1901? 1896 is the only year with a Monday March 2nd in the range 1895-1901. [http://www.flickr.com/photos/gnmcauley] Niall, where are you getting the Kennedy Brothers from? Were they not Broad Street in Cork? (Please excuse the dangling preposition) Or had they moved on to Cork by 1901 and I've just missed something in your comments above? The 1894 Egan directory (with Gibson still there) is at the Lennon Wylie page. World Renowned Boot People is a good band name. But could I get a pair of Cowboy Boots from them?